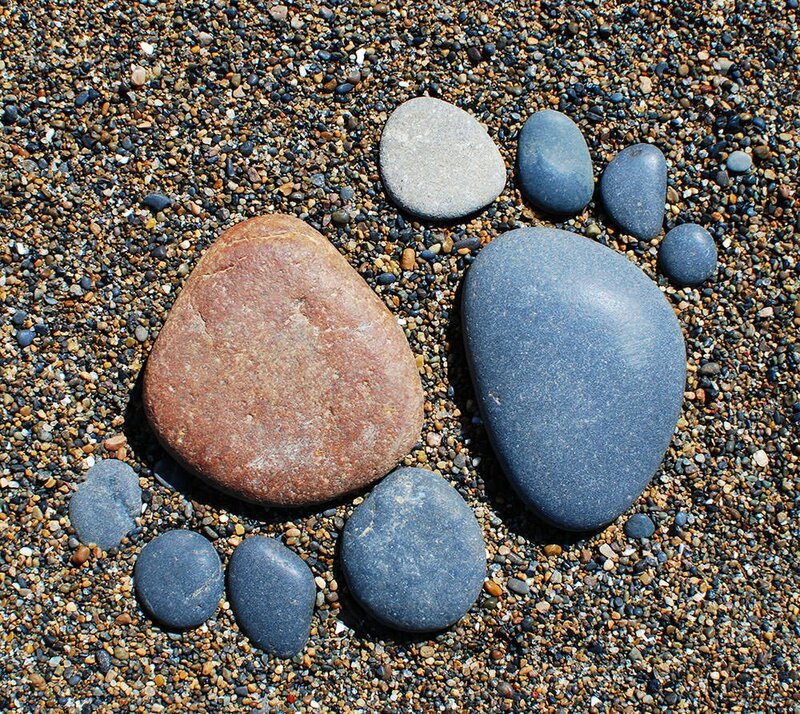 Creating rock feet has taken Pinterest by storm, and I must admit, it appeals to my family side, but doesn’t look too cutesy. Love this! Instructions are pretty self explanatory. ;) We actually took this photo while we were at the beach in Depoe Bay Oregon, but obviously you can do this anywhere. Just spend some time finding the right rocks for what you want to achieve. Here is another example of using rocks in the garden that we came across. Love these cute little feet! Feet not your thing? :) How about a rock fish? 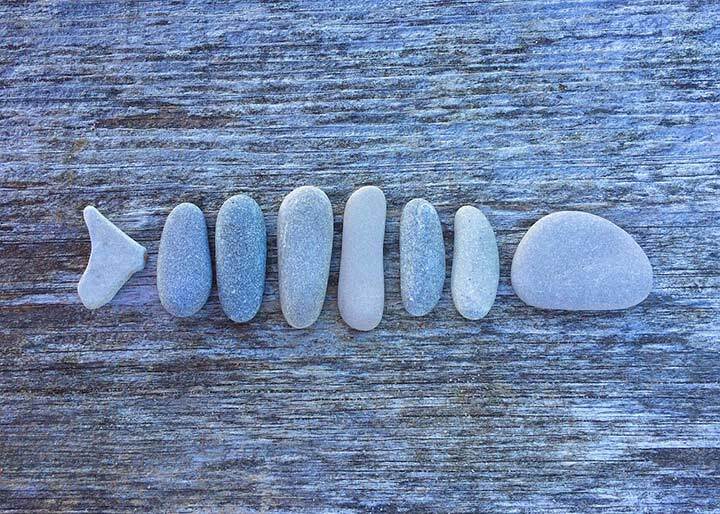 Remember again, you can either leave these stones loose so that you can change the design often, or you could use construction adhesive to lock them into place as well. 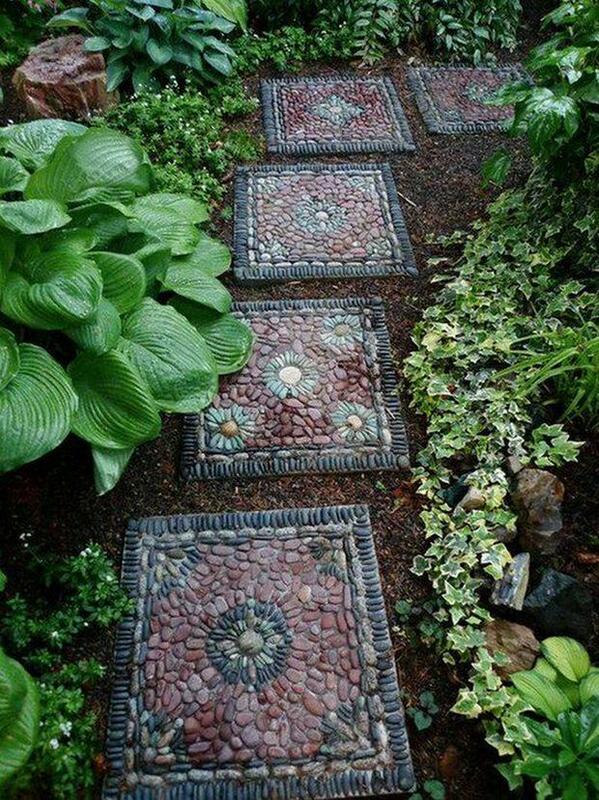 Create mosaic art with stones on planters, stepping stones, or even in the ground as an accent to your plantings! Lay out your stones in the desired pattern first, then transfer to your surface and attach with construction adhesive. Check out the tutorial over at ‘Jeffrey Gardens’. 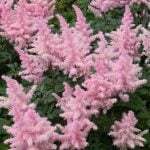 Another kids favorite, but great for any garden where nature has a hand. Pick up some simple gems, sequins and spark lies at the dollar shop or craft store. 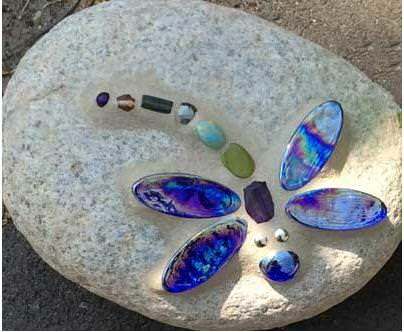 Choose a stone that’s slightly larger than the dragonfly you wish to create, and about the right shape. Lay out your sparklies until you have a design you like, then transfer and attach with construction adhesive. Looks cute tucked into some long grass, or in a ground-cover to partially hide the stones edges. This one from ‘Wisconsin Made’ gives you the idea or you can buy it from them here. 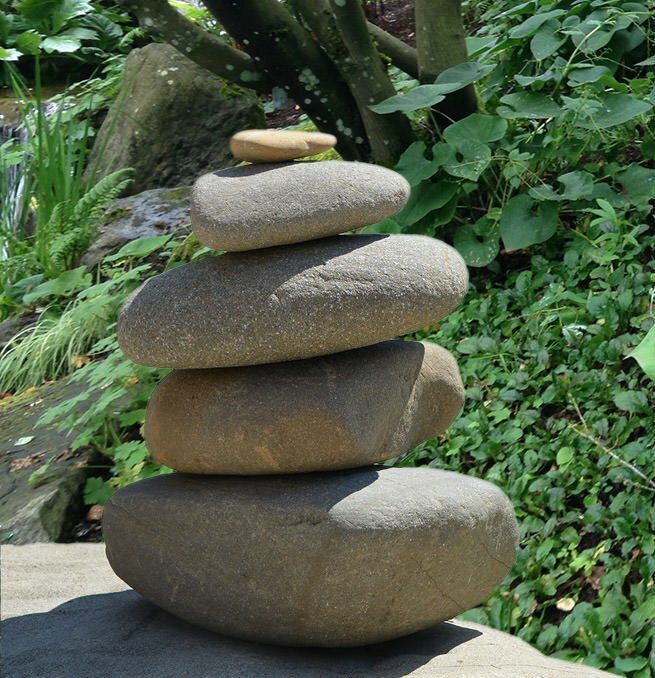 Here’s an easy stacked rocks idea that we made with just ordinary rocks that we found by looking around the garden and yard. Remember, you are never looking for perfection when building a cairn. 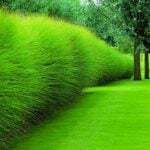 Honor nature. Here are some stacked rocks we made real fast at our friends house in Seattle! 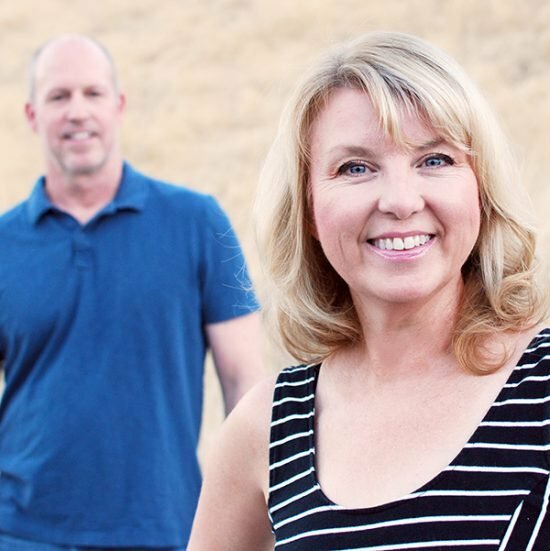 Did we mention, it’s a fun thing to do as well! 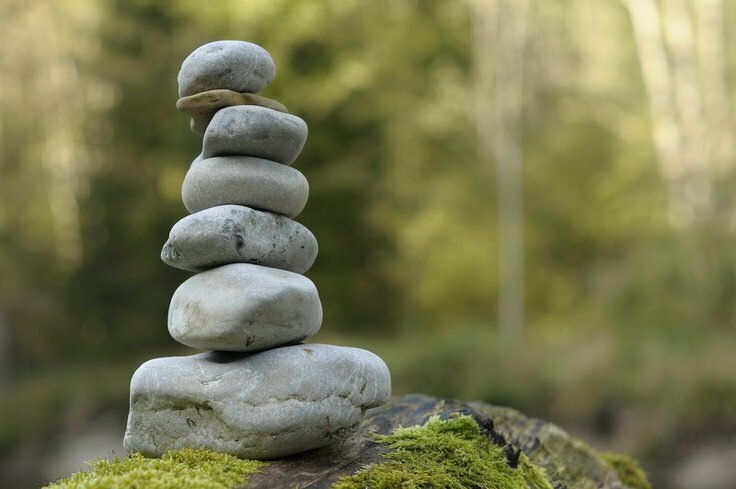 Although we love the fact that we have to work hard at rock balancing, you could also use a construction adhesive to hold the stones in place. This would make it more of a stone sculpture. Remember the pet rock? 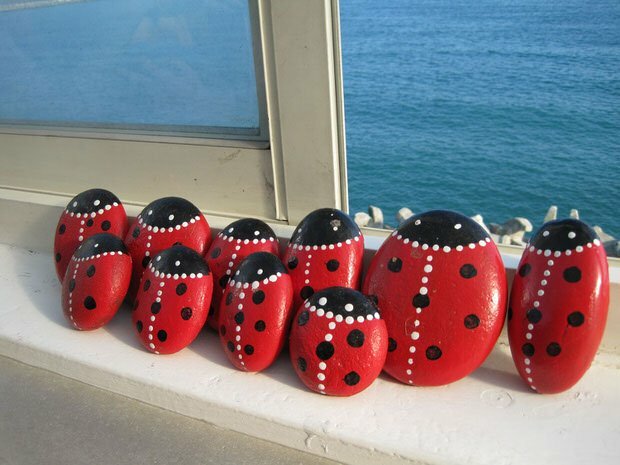 There are a lot of cute and easy ideas for painting ladybug rocks that make a garden a delight for young and old alike. Great way to bring kids into the joy of gardening. Not sure of the source of this cute photo below. If anyone knows, please let us know in comments. This ladybug craft is from an Etsy shop called ‘BeachMemoriesByJools‘ , but is very DIYable. 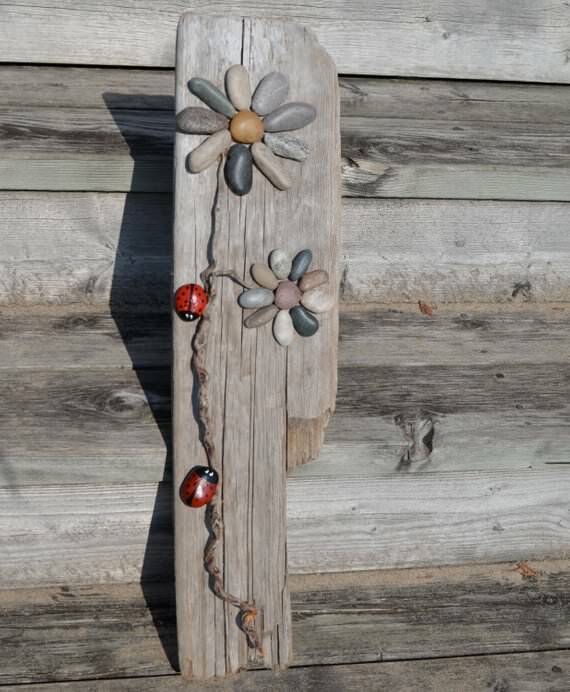 Use stones from the garden for this rock craft, then attach them to a piece of reclaimed wood. 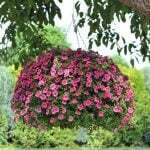 Now all you have to do is find a corner of the garden to display it! Simple! Pretty stones, pretty saying, paint pen. 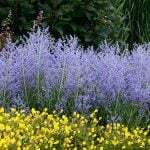 Display on a walkway, piled in a planter, or tucked next to special plants as secret garden surprises. 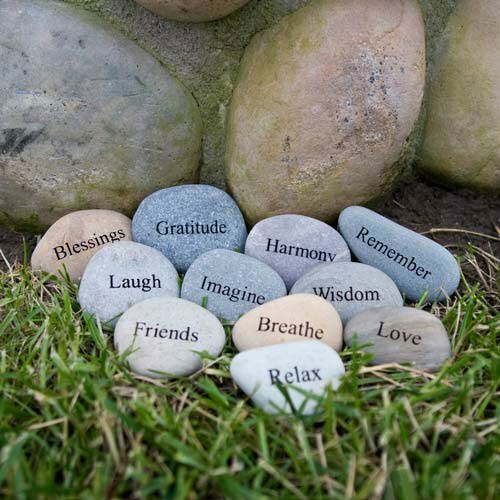 A great example are these inspiration stones. DIY them with oil based paint pens or buy them from ‘Elizabeth’s Embellishments‘. From ‘Tangly Cottage Gardening Journal‘ is this great downspout creek bed idea. A great way to use up the rocks in the garden! If you want to have a DIY Creek Bed become a larger part of your garden design, check out our post how to build a dry creek bed! 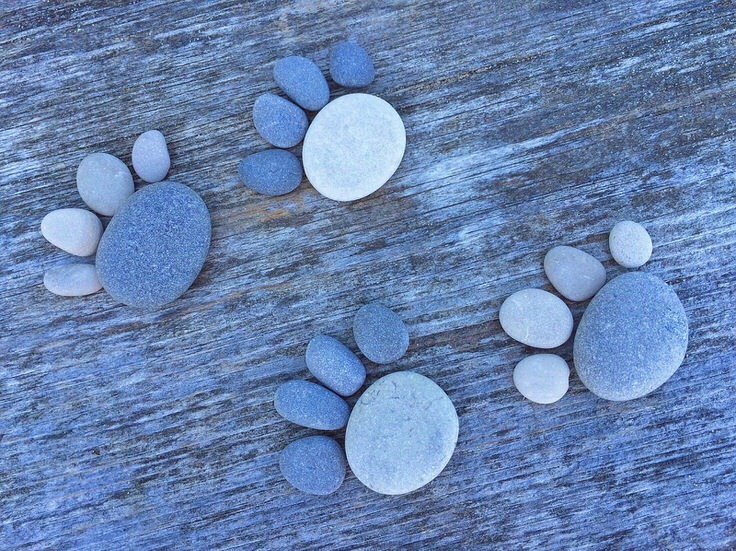 Creatively using stones and rocks in the garden is an inexpensive way to add a touch of whimsy and creativity, yet keep your garden space natural. Oh yea, and now you don’t have to pay the chiropractor! 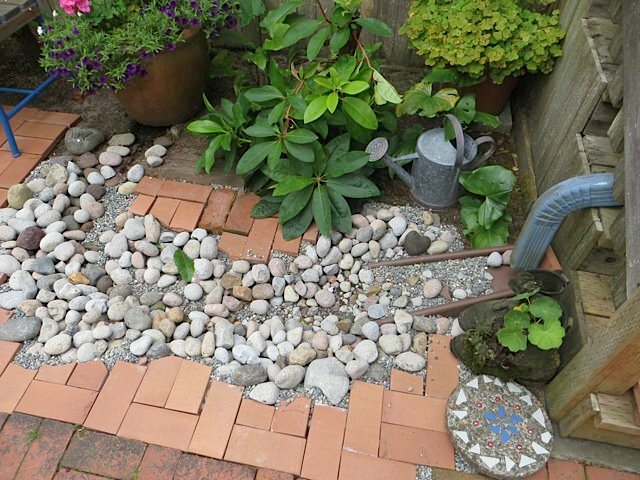 Also try our posts on DIY Garden Ideas with Rocks and How to Build Pond! You have some great ways to decorate with rocks. 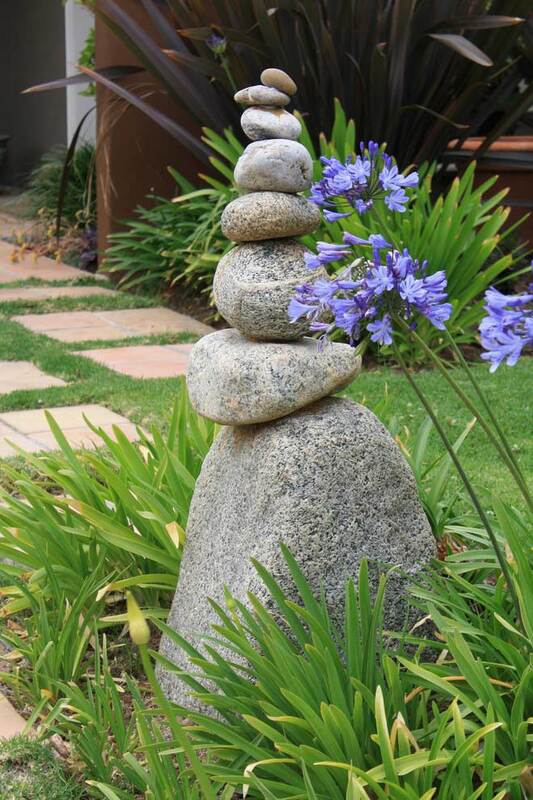 I love the idea of having cairns in my yard, since they are so creative and neat! Can you imagine a garden walkway lined with those stacks of stones? If you do that, please send us a photo! I was looking for inspiration to help get creative with a tile mosaic for our bathroom. Nothing was speaking to me… Till I saw the dragonfly!! Love love love!! Thanks for sharing!! Where am I able to purchase a Cairn for my yard as part of my landscaping. 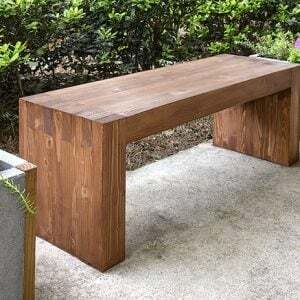 The size I am looking for is approx 2-3 feet tall. Any information would be greatly appreciated. I think most people create their own… readers, any ideas? 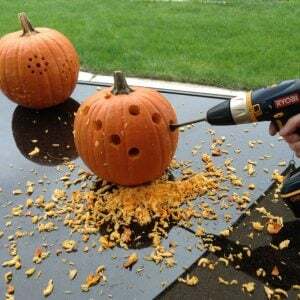 Use a masonry drill to drill through the rocks you have. Round smooth river rocks look best I think, because they are somewhat uniform in shape. Put the heaviest largest one on the bottom. Stick a piece of rebar in the hole and hammer it at least a foot into the earth below. Then keep stacking the drilled rocks up the rebar. Cut off the rebar when you get to the top stone and glue a little one on the very top or something else distinctive for a finial. Or you can let the rebar protrude almost through the rock and fill the rest of the hole with liquid nail.